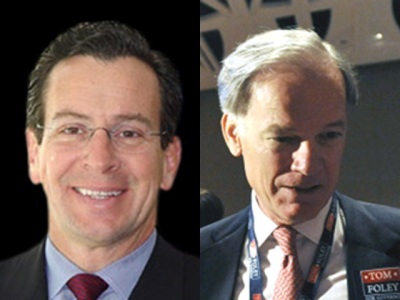 A Rasmussen poll released over the weekend puts Democrat Dan Malloy slightly ahead of Republican Tom Foley in the race for Connecticut governor. However, Foleys’ numbers are better than they have been in previous polls and Rasmussen has moved the race from “leans Democrat” to a “toss-up..
Malloy has 49 percent of likely voters, Foley has 45 percent and 5 percent are undecided. In September, Malloy has a 10 percent lead. Nationwide, Rasmussen is projecting 13 Democrats to secure governor seats and 27 Republicans. Ten races are toss-ups, including Connecticut. Days after Quinnipiac University’s poll put Democrat Richard Blumenthal 11 points ahead of Republican Linda McMahon, Rasmussen has Blumenthal five points ahead.